It’s literally stronger than it looks. The old cliché that looks can be deceiving definitely comes to mind when considering a new material developed by researchers from the Hokkaido University. It looks soft and squishy — which it is — but it’s as tough as metal. In fact, its developers say it’s five times stronger than carbon steel, while at the same time having the flexibility of rubber. The reinforced material is a product of combining hydrogels, typically found in products like contact lenses, with glass fibers. The result is a tough but bendable mesh that’s built to maximize resilience. “It’s the strongest soft material ever obtained by human beings,” lead researcher Jian Ping Gong told CNN. The new fiber-reinforced composite demonstrates “extremely high toughness and tensile properties, far superior to those of the neat components, indicating a synergistic effect,” the team wrote in their research, which was published in the journal Advanced Functional Materials. 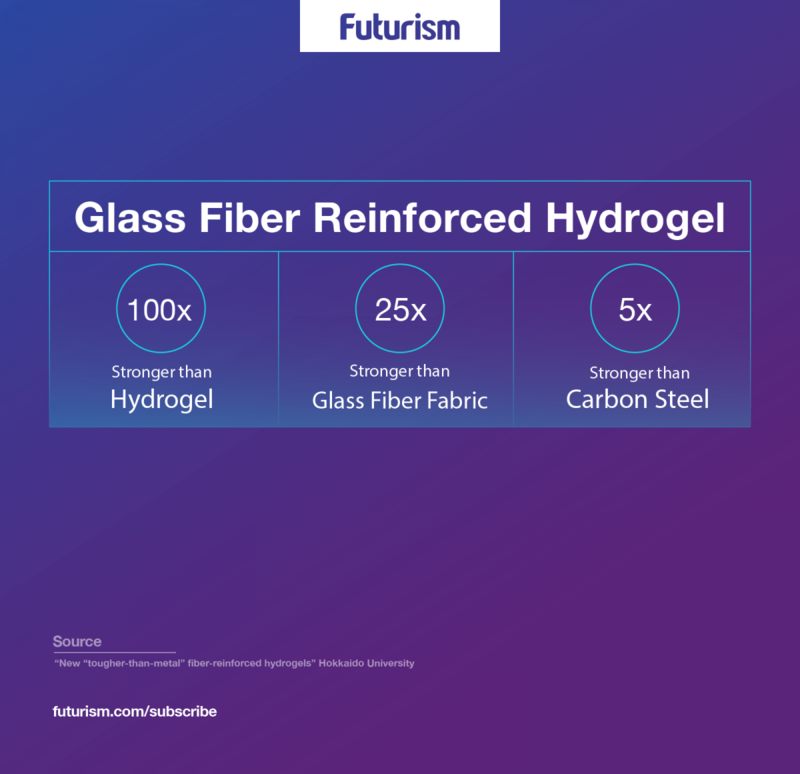 Based on how much energy is needed to destroy it, this fiber-reinforced hydrogel is about 100 times tougher than regular hydrogels, and 25 times stronger than ordinary glass fiber fabric. With today’s more advanced engineering and design technologies, scientists have been experimenting with a number of materials to come up with so-called metamaterials. These are synthetic composites of existing materials with properties not found in their original components. Research in this field has led to the development of several shape-shifting metamaterials. One can be used for charging devices wirelessly, and another that moves using light. The Japanese fiber-reinforced hydrogel, on the other hand, offers even more potential applications. “The material has multiple potential applications because of its reliability, durability and flexibility. For example, in addition to fashion and manufacturing uses, it could be used as artificial ligaments and tendons, which are subject to strong load-bearing tensions,” Gong said in a press release. Indeed, such a soft but tough material seems perfect for biological substitutes; artificial joints made with it could be even stronger than the real thing. Gong’s team is already in talks for potential collaboration in developing artificial cartilages with several companies. Apart from developing artificial organs, Gong also sees applications in sports clothing and protective gear, such as helmets and bullet proof vests. “I think it could have very good performance against a bullet,” she told CNN. Even better, because the composite hydrogel has a 40 percent water level, it’s also environmentally friendly.